that integrates repeated patterns of forms or symbols. 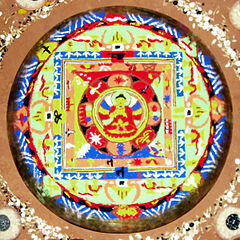 The purpose in making or viewing a mandala is to meditate or pray. The overall design represents a universal principle. The term is Sanskrit, meaning “circle.” Both Hindu and Buddhist traditions have developed rich traditions of mandala making and meditating. 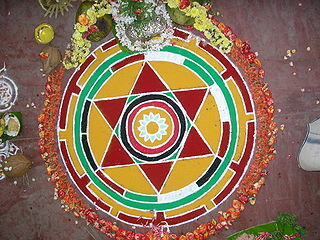 Hindu mandalas (yantras) focus the mind on symbols and shapes that represent the home of the deity. Buddhist mandalas include images of deities and saints, and are presented as architectural diagrams of heavenly temples. One enters through 4 gates to a circle of wisdom and inner chambers of divine truth. To emphasize the fleeting nature of the physical world, these mandalas are sometimes made of sand, used in particular rituals, and then swept away to be returned to a river or stream. 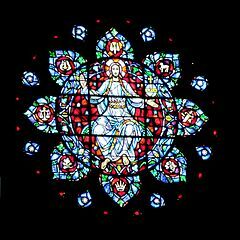 In Christian traditions, mandalas appear as the magnificent rose windows in European cathedrals. The work of Hildegard of Bingen and other medieval Christian mystics also relies on a mandala form. Native American traditions utilize mandala forms to create Medicine Wheels and Medicine Shields that heal and protect the people. In the Southwest, sand paintings including deities and symbols are also used for healing ceremonies, and then swept away. Other forms of art and prayer are closely related to mandalas—labyrinths (a walking meditation), rangoli (colorful patterns made of rice flour), even Pennsylvania Dutch hex signs (actually prayers for protection). I hope to explore them all on my blog, which will launch after the store! Check back for more interesting ideas and beautiful images of world traditions. Here's a booklist if you want to read more.